Mobility has undoubtedly transformed the way enterprises function in the modern times. Organizations are waking up to the reality that enterprise mobility can substantially increase productivity by developing effective enterprise apps. 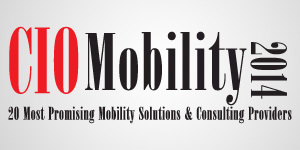 We present to you the ‘20 Most Promising Enterprise Mobility Solution Providers’. CodeMyMobile A provider of business solutions in mobility space serving platforms in Android, BlackBerry, Windows and HTML5. Mobile Reach A provider of mobility software solutions that enable cost savings, increased worker productivity, more efficient workflows, and unlimited scalability to support a growing mobile workforce.